Objective: To examine the maternal and neonatal factors associated with offspring adiposity and the role of birth and placental weight as potential mediators in such associations. Design: The Tasmanian Infant Health Survey was a prospective cohort study conducted between 1988 and 1995 in Australia to investigate the cause of Sudden Infant Death Syndrome. This large infant cohort provides measurement of skinfolds on 7945 mothers and their offspring. Participants included singletons born ≥ 37 weeks gestation who were at high risk of sudden infant death syndrome identified through a composite score that included birth weight, maternal age, neonatal gender, season of birth, duration of second-stage labor and intention to breastfeed. Measurements: Neonatal adiposity was assessed from skinfold measurements of the subscapular (SSF) and triceps folds (TSF) taken at birth. Maternal early-pregnancy body mass index (BMI) was calculated from self-reported height and weight. Neonatal data were extracted from birth records. Data relating to other environmental exposures were obtained from questionnaires administered when neonates were ~4-days old. Results: In multivariable models, higher maternal adiposity, increasing maternal age, gestation age, delivery by Caesarian section and female gender were associated with larger SSF independent of placental and birth weight (P�<�0.001). Maternal age and delivery by Caesarian section were significantly associated with larger TSF, whereas gestational age and male gender were associated with thinner TSF independent of placental and birth weight. Higher early-pregnancy BMI, maternal weight gain, maternal age, parity and gestational age were significantly associated with larger placental and birth weight. Smoking during pregnancy was associated with smaller birth weight but not with placental weight. 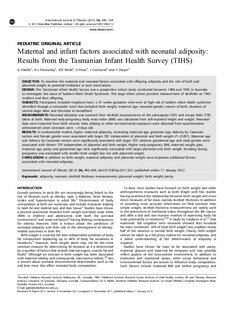 Conclusion: In addition to birth weight, maternal adiposity and placental weight were important additional factors associated with neonatal adiposity.